"Tevye Served Raw (Garnished with Jews)," adapted and translated by Allen Lewis Rickman and Shane Baker from the Yiddish stories of Sholem Aleichem. Directed by Allen Lewis Rickman. Original music by Alex Ryaboy. Photo courtesy of the Playroom Theatre. 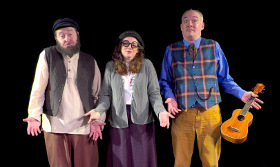 "Tevye Served Raw," based on the stories of the incomparable Sholem Aleichem, is, at times, rollickingly hilarious, at times almost heartbreakingly sad. Although the stories date from the turn of the twentieth century, the human conditions they explore are timeless. "Tevye Served Raw" is far from a museum piece. The acting is always spirited, the script and innovated direction are clever. The show has been crafted with love for Yiddish traditions. It not only entertains, but may also motivate you to learn Yiddish so you too can laugh before reading the supertitles. As for the supertitles, much of the 90 minutes is in English because of an instant on-stage translation – and the translation is part of the comic pleasure. The show opens with a spiffy Sholem Aleichem (Shane Baker in an eye-catching costume by George Spelvin) chatting with us. He became a writer, he tells us, because he was terrible at everything else. He spent eleven months of the year traveling, on the lecture circuit, reading his stories to paying audiences. And as he traveled, he collected material – much of the material in the show. My favorite skit was "Strange Jews on a Train." One traveler to the town (Yelena Shmulenson) wants to hear the local gossip, especially about a certain rich man. And the other, a resident, (Shane Baker) pretends reluctance. He needs continual coaxing and Shmulenson's character is persistent. He offers his tidbits with a disclaimer – "But it's baloney" – as he shares juicy snippets about the husband, wife, and both daughters. The comedy is enhanced by the acting – which is filled with comic excess and surprise choices. The staging is inspired. 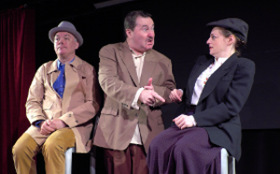 Standing between the two Yiddish speaker is a highly engaged translator (Allen Lewis Rickman), on the premise that the two gossips speak different languages with English as their common tongue. So we are in on the jokes while being offered a double wallop of reactions and acting styles. The exchange is filled with vaudeville rhythms. Occasionally the actors step out of character and interrupt the beat to react -- to the translation. "Chatty Cathys?" one ask. And in another skit an actor challenges "Bring home the bacon"? From the wings we hear a stage whisper: "It's a Jewish show. You cannot say ‘bacon'." 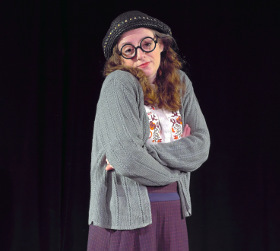 "The Yiddish Sisyphus," another skit, is both comic and affecting. While his new bride remains at home, a naïve salesman travels from town to town, taken in by con men and conniving merchants. Recited as a series of letters between the newly weds, we hear her exasperation with him lead to sarcasm and lots of scolding. We feel her frustration and watch his eyes open in horror as she writes that they will be married until she is 120. Despite the pogrom that interrupts the wedding in "Fiddler on the Roof," the musical, is a feel-good visit to the shtetl. The excerpts from Aleichem's play about the Jewish dairyman are darker, less dramatic but more nuanced. In the last, Golde, Tevye's wife, has died but he has saved enough money to fulfill a lifelong dream, to relocate to Israel. But Motel, his daughter's husband, died and now he must become a father to her children. And Chava, the daughter who abandoned her faith to marry, wants to return. Should he take her back, he asks Sholem Aleichem. The program ends with "A Stepmother's Trash Talk," a hilarious linguistic romp that ends with a surprisingly warm, and probably loving cackle. Yelena Shmulenson and Allen Lewis Rickman played the shtetl couple in "A Serious Man," the Oscar-nominated film by the Coen brothers. Shane Baker is billed as the best-loved Episcopalian on the Yiddish stage. Sholem Aleichem's writings fill 28 volumes. The Congress for Jewish Culture was founded in 1948 and actively promotes all things Yiddish. In the program they even offer to translate the writing on the back on your grandmother's photographs.